We are a Certified Santa Clara County Green Printing Business. What does that mean? The Santa Clara County Green Business Program certifies businesses that have incorporated environmentally sound practices into their business operations. To be certified, JP Graphics passed a rigorous on-site evaluation in compliance with all environmental regulations and met rigorous program standards for conserving resources, preventing pollution and minimizing waste. Review the California Green Business Program requirements for printers, met by JP Graphics. Download the official 100% green logo. JP Graphics offers green paper at no extra cost on our products. We use elemental chlorine free, acid free / archival quality recycled content for our print clients; including premium coated stocks and board stocks. Specialty orders can be placed for non-recycled products; however, the JP Graphics standard is 100% green. Download the complete specifications on our green premium coated stocks and board stocks. Download the information on our Process Free Plates which significantly reduce our carbon foot print. We produce about 75% of our electricity needs with our solar panels. JP Graphics is one of the first certified Green Businesses in Santa Clara, CA. Santa Clara city staff recently interviewed Joan Escover, President of JP Graphics. Read the entire interview here. 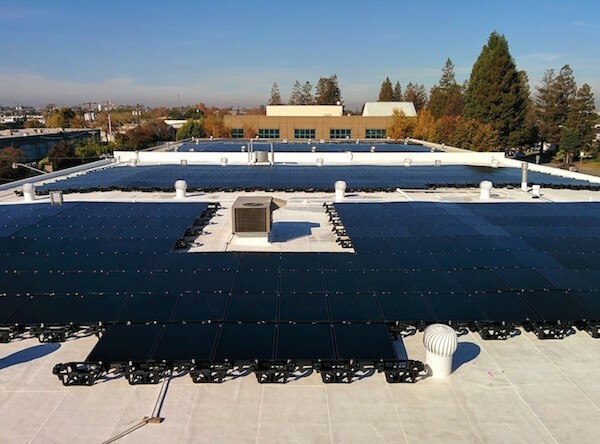 Here’s a picture of the solar panels on the roof of our green printing facility in Santa Clara, CA. JP Graphics recently received a green printing commendation from the Santa Clara County Board of Supervisors! Read more here….